As we drove around the Lake Chelan area I was overcome, once again, by the apple orchards rolling over the hillsides. We visit this area throughout the year; however, it’s the starkness of winter that brings a chill to my bones, and arouses memories of the orchards my Grandpa Leo tended in the Yakima Valley of my youth. When there are no longer leaves clothing the limbs of the fruit trees, I see history in the thickness of the limbs and trunks⎯the old bones. The bent nature of the branches is one formed in youth by the ongoing guidance of the orchardist. The open structure allows for airflow, sunshine and maximum crop bearing for many seasons to come. From season to season my grandfather found purpose and marked time as he fell into the rhythm of the orchards, as he merged with its history. This is the time of the year when one hears the clickity-clack of the three-legged ladders as they are moved about the trees and the snip, snap of the loppers as the pruning crews work their magic through the orchards. As a child, I would find my grandpa preparing for the job at hand by sharpening his loppers and repairing the orchard ladders in his shop. Over the years, I spent hours watching him hone his tools⎯many of which I still use as I snip, snap the loppers in the trees around my home. Grandpa died more than twenty five years ago, but when I look out on any orchards today, I see him in the layered bark. So rich with history are these layers as they form⎯recording the lean years, the rich years⎯marking the passage of time. 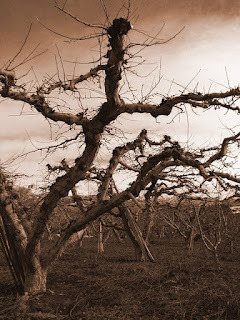 There seems to be an endless routine of life here⎯as if my grandpa's old bones have become one with all fruit trees. I am drawn to routine and a certain cadence of life. I am drawn to the garden to snip, snap my way around, bringing life to my old bones. Have you considered what your comfort routines are, what your cadence, rhythm or pace is? Do you honor this rhythm from time to time, or do you find yourself moving beyond what your comfort is? Perhaps it is time to explore just what your cadence of life might be; after all, it changes from time to time. Bring new life to your old bones⎯no matter how young or old you are.